No. 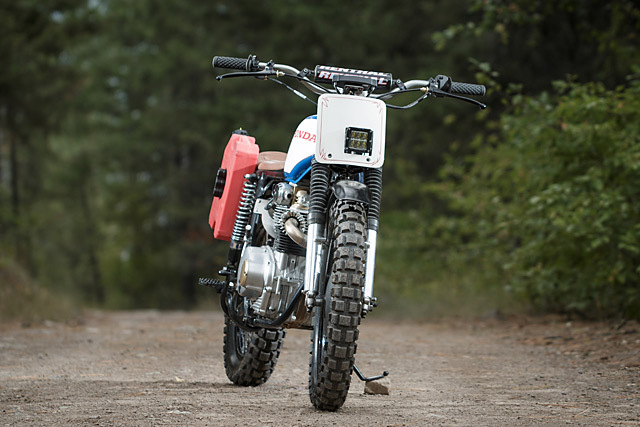 8 Wire Motorcycles is named after the thick fencing wire that embodies the ‘can do – make do’ mentality New Zealand was built on. As one of the most far-flung reaches of the British Empire, early settlers in the land of hobbits found themselves having to improvise their way around everyday problems that couldn’t be solved with a ready-made product and stack of cash like back in the mother country. And it’s that innovative attitude that Colin, the Kiwi ex-patriot head of No. 8, aspires to. 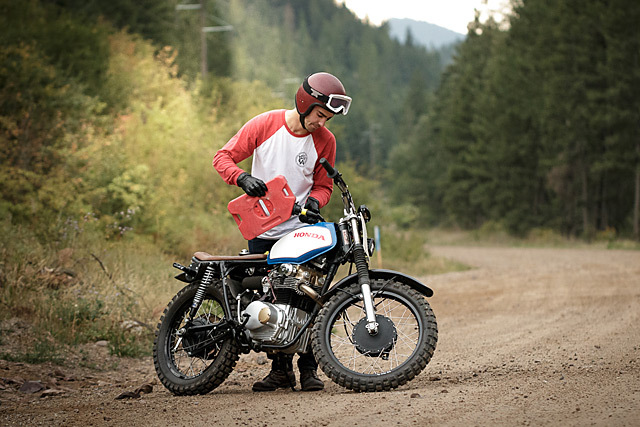 Heading a one-man shop based in Missoula, Montana, Colin works on all manner of motorcycles. 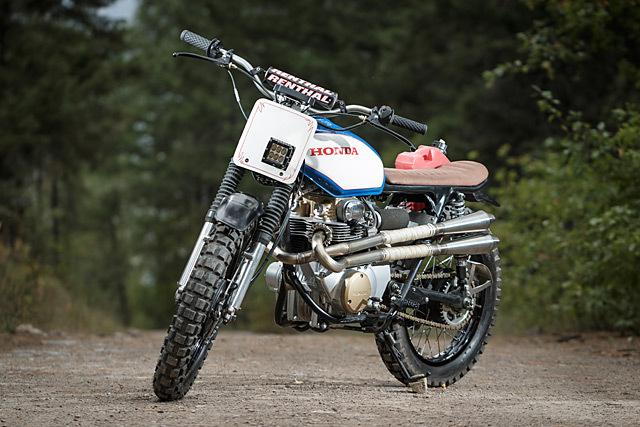 In recent months he’s turned his hand to the diminutive GN125, a R90/6 bobber, KZ550 tracker, a passing Goldwing tourer and even a Polaris snowmobile. 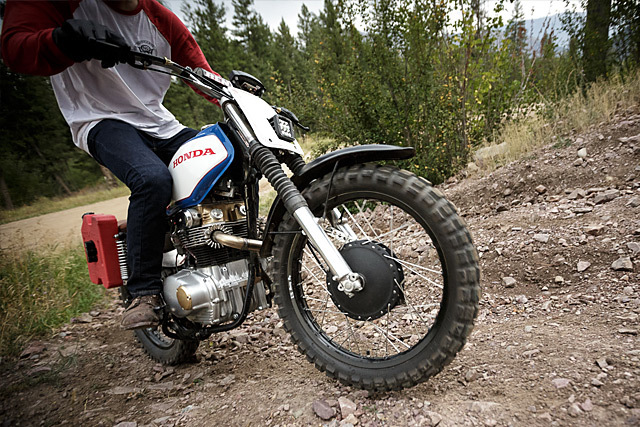 But most of his time has been spent lavished on this curious Honda CL350 scrambler. 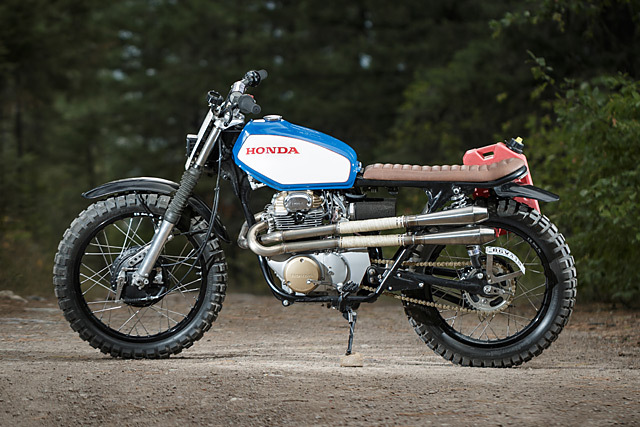 This CL350 is actually a commissioned build from a local customer, a local who approached Colin with a modified frame and a gas tank from an XL350 that he wanted to mate together. 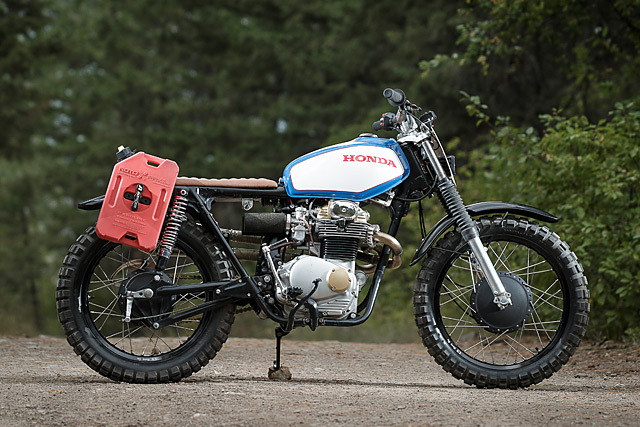 In between camping trips across the state Colin did just about all the work on the bike, save for the paint, upholstery, valve grinding and cylinder boring, with some styling cues and suggestions from the owner. But the bulk of the work Colin did himself. 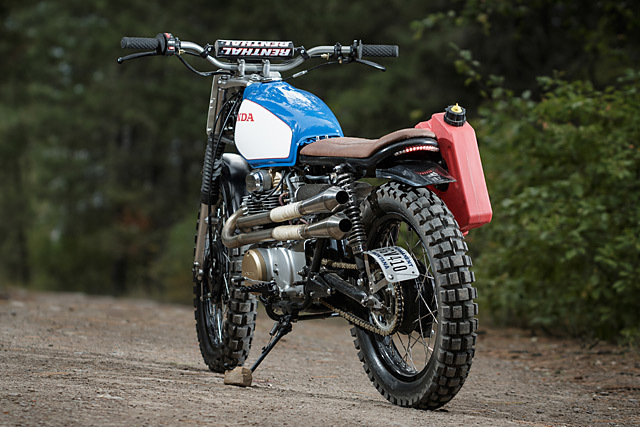 The XL350 tank that the owner desperately wanted to fit to the bike had to be gutted and re-tunnelled to clear the existing frame, with new fore and aft mounts welded in to make certain that it cleared the engine head and coils. When that was in place, a pre-made tail loop was welded onto the cut down frame and the front forks were reinforced. The headlight brackets and surround were also fabbed up by Colin and a slimline Trailtech speedometer was mounted in front of the Renthal MX bars. 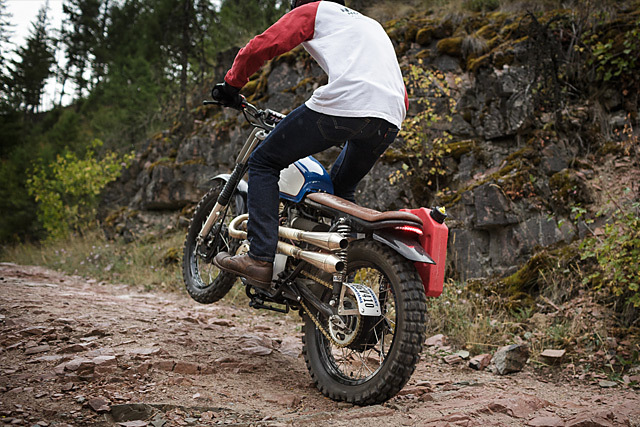 Further back on the bike you’ll find a Rotopax fuel tank perched on a mount that was also manufactured by Colin, a nod to the bikes’ practicality that also gives it a bit of a functional air. The work continues inside the little CL’s engine, with Wiseco pistons, a more aggressive camshaft and a pair of Mikuni VM34 helping make the Honda a lot more reliable and a little bit quicker. The stainless steel exhaust system ending in Cone Engineering megaphones was also made in-house and the whole thing barks into life with a new electronic ignition and Dynatek coils. Making it all roadworthy and legal is a modified front guard from a SL350 and a generic Acerbis plastic rear guard, sitting below a Custom Dynamics integrated brake and turn signal unit. In New Zealand’s formative years it was said nothing couldn’t be fixed with a length of No. 8 wire. 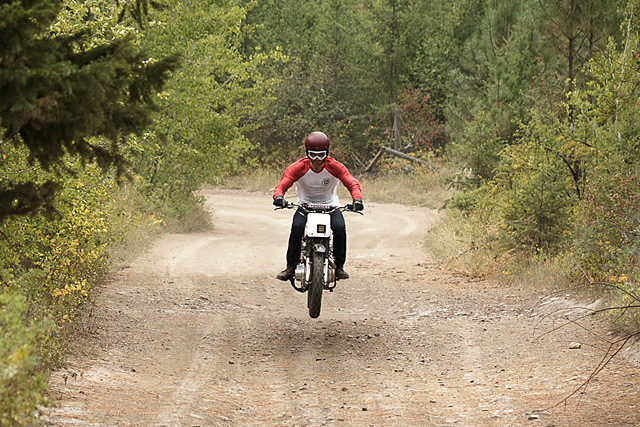 And that attitude still prevails today, and nowhere is it more apparent than in the world of motorcycles. Kiwi ingenuity has bred some of the most dogged and inspirational figures ever seen in the world of mechanics, most notably Burt Munro (of the ‘World’s Fastest Indian’ fame) and John Britten, the polymath who built and designed one of the most innovative motorcycles ever seen, the Britten V1000. And while Colin would be the first to point out that the work he does is very different to these two legends of the industry, it’s great to see him carry this attitude to his adopted country.